Estampe has many Reynolds & Reynolds dealership forms and supplies especially designed for the accounting department. We sell supplies that are designed to help Office Managers and Comptrollers manage their departments more effectively. Estampe offers authentic online savings on many dealer supplies for use by automotive and truck dealerships who use the Reynolds and Reynolds ERA® dealer management system. Our products are guaranteed to work with your Reynolds & Reynolds dealer management system. If you are looking for custom forms please call us at 1-866-348-6414 for a custom quote. Deal Jackets - Blank for Auto Dealers: Durable heavy weight vehicle deal jackets that let you store all important deal papers securely in one convenient file. Use our blank envelopes and affix your own labels or hand write your own information. Available BLANK in Buff, Blue, Pink, Green, White, Lavender, Salmon, Fuchsia, Gray and Yellow colors. COMPARE OUR PRICE to Great American Automotive Products. They sell Blank Vehicle Deal Jackets for more … American's Price is 500 @ $175.00 (SKU # BFA1220). Save money by printing your own checks on these high quality and very secure Blank Stock Business Checks. We offer 9 different layouts and three different colors - dark blue, green and burgundy. This Laser Cash Receipt Form is formatted to be compatible with the Reynolds and Reynolds ERA® dealer management software system. A center horizontal perforation allows separating the top half from the bottom half for distribution. Printed on 20 lb. white laser compatible paper. If your current cash receipt form looks like this illustration our form will align to your software perfectly. This Application for Employment form has been designed specifically for the automotive industry and to strictly comply with State and Federal Fair Employment Practice Laws prohibiting employment discrimination. Perfect for smaller dealerships. This Employee Attendance Tracker form is perfect for small auto dealerships and repair shops. Now you can keep an accurate records of each employee with this easy to use attendance tracker. Use this Employee Confidentiality Agreement form to clearly spell-out and strongly convey to each employee you hire the importance of your company's confidentiality policy and proprietary information. Employee File Folders: Keep track of all your human resources forms in one convenient location with Estampe's Employee File Folders. This cash receipt system allows posting to the journal as a by-product of writing the receipt. If you already use this type of system, save money on these replacement cash receipts. They're available in 2 or 3 part style and are printed on clean carbonless paper. COMPARE PRICING: Great American Automotive Products charges 57% MORE (250 @ $31.50 - BFA293) for their time cards. These time cards are 3 1/2”W x 9”H. Be sure to view the enlarged image to be sure it matches your dealership's current time cards. These Cash Receipt Books are NCR (no carbon required) and coil-bound with 200 sets per book. They are available in 2-part, 3-part or 4-part. The metal coil-binding allows our cash receipt books to always lay flat regardless of what page you are writing on from the first page to the last page. COMPARE PRICING: Great American Automotive Products charges 55% MORE (3 books @ $107.25 - BFA138-3) for it's 3-part receipt books. These carbonless Automated Cash Receipts Books are coil-bound with 200 3-part sets per book. The metal coil-binding allows these cash receipts books to always lay flat regardless of what page you are writing on from the first page to the last page. COMPARE PRICING: Great American Automotive Products charges 20 Books @ $552.00 - BFA139-3C for it's 3-Part Automated Receipts Books. This Laser Statement Form is formatted to be compatible with the ERA® dealer management software system. A horizontal perforation allows separating the top 3 1/2” as a return payment stub. Printed on 20 lb. white laser compatible paper. These can also be overprinted with your dealership personalization. 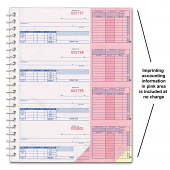 This Fuel Requisition Books has 3 parts and is sequentially numbered for added control. Comes with handy, heavy-duty wrap around cover to prevent write-through. This is a popular and widely used dealership form used for tracking gasoline expenses by department, stock number, date and more. Even with today's automotive software systems, there is no substitute for these Accounts Payable Folders. If you're trying to figure out how to set up a filing system for your dealership's accounting department, these Accounts Payable Folders are a very effective solution. This general accounting style is also popular with body shops, motorcycle dealers, RV dealers, truck dealers, tire and used car dealers. These Accounts Payable File Folder Jackets are specifically designed for automotive dealers who are using dealer management systems (DMS). This is the most common accounts payable voucher envelope used by automotive dealerships for their accounting filing system. COMPARE PRICING: Great American Automotive Products charges 30% MORE (250 @ $110 - BFA650) for their Accounts Payable File Folders. General Journal Vouchers: This horizontal style general journal voucher format is designed for use with the *ERA® & *VIM® accounting system and compatible with R&R® form CTM-153-L. It's printed on heavy 20 lb. paper and punched for any post storage binder. General Journal Vouchers: This horizontal style general journal voucher format is designed for use with the *VIM® accounting system and compatible with the Reynolds & Reynolds system. It's printed on heavy 20 lb. paper and punched for any post storage binder. COMPARE PRICING: Great American Automotive Products charges 70% MORE (100 @ $28.50 - BFA168) for their Deal Labels. These Vehicle-Car Deal Labels match all dealer management software systems. The gummed back on part 1 of this dealer label will adhere to the deal jacket or file folder. COMPARE PRICING: Great American Automotive Products charges 68% MORE (250 @ $42.50 - BFA293) for their time cards. These time cards are 3 1/2”W x 8 1/2”H. Be sure to view the enlarged image to be sure it matches your dealership's current time cards. This envelope contains a complete history of each petty cash transaction. This petty cash envelope is printed in brown ink on white 24 lb. policy envelope with end flap. This petty cash voucher controls petty cash disbursements and expenses to the correct department in your auto dealership. They're pre-numbered with 100 sheets per pad, (no selection of starting number) and printed in blue ink on canary 20 lb. paper. The use of Check Request Forms is an important part of your car dealership's accounts payable process.